Koko, a western lowland gorilla who bridged the gap between wildlife and humans, died in her sleep Tuesday, according to her host organization, The Gorilla Foundation. Koko was 46 years old. According to the Smithsonian, western lowland gorillas can live into their 50s in captivity, though such a long life is rare. Koko became a pop-culture phenomenon through the late 20th and early 21st century. After her unique grasp of human language and behavior landed her on the cover of National Geographic in both 1978 and 1985, her love of kittens and subsequent kitten adoption made her a viral celebrity of the pre-YouTube era. Koko was visited by several high-profile celebrities in the late ‘90s and early aughts, most notably Fred Rogers and Robin Williams. Her encounter with Williams, in which the two tickle and chase each other, laughing together, received national attention and became a part of Williams’ stand-up routine. The Gorilla Foundation posted footage of the meeting to their YouTube channel following Williams’ untimely death. 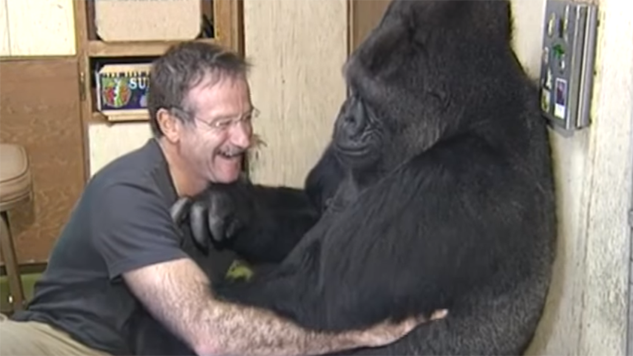 “When Koko learned of Robin’s passing (on Aug. 11, 2014),” the video description reads, “she became very sad. We hope this video will lift her spirits and remind everyone of the profound gift of joy that Robin Williams brought to our world.” The video currently sports 5.5 million views.